Where Does Copper Come From? Trends In Copper Alloy Scrap In The U.S.
Born into a creative family, artist Alison Saar developed a fascination with art objects and artifacts from around the world at an early age. So, it was only natural that this daughter of an art conservator and well known artist Betye Saar, would go on to have her own artistic influence on the world. Greatly inspired by outsider art (such as Simon Rodia’s Watts Towers in Los Angeles), pre-Columbian and African art, Saar went on to receive her BA from Scripps College in 1978 where she studied with noted art historian Dr. Samella Lewis. She earned her MFA from Otis-Parsons Institute (now Otis College of Art and Design), and became known for her signature bronze sculptures which examines the collective relationship to nature and the mythologies that bind disparate cultures together. Her latest show, currently on display at New York City’s Madison Square Park Conservancy features six bronze installations that draw inspiration froၼm the cyclical qualities of life and nature. Titled Feallen and Fallow, the outdoor exhibit takes park visitors on a journey through the four seasons as inspired by the ancient myth of Persephone. The installation includes four larger than-life works cast in bronze, featuring the seasons as embodied by the female form at different stages of maturation. Together the series tells of the Greek myth of Persephone, daughter of Demeter and Zeus, who embodied the earth’s fertility and whose tale gave rise to the establishment of seasons. Feallen and Fallow is a commission of the award-winning Mad. Sq. Art program, and will remain on view daily from September 22 through December 31, 2011. In addition to the new series, the exhibition also includes two Treesouls (1994) that stand 14 feet high among the Park’s existing foliage. 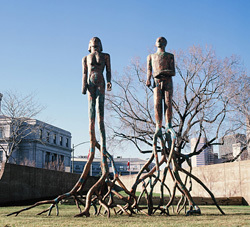 Comprised of found and sculpted wood with copper cladding, the pair depicts a coupled young man and woman whose legs dissolve into the earth as a web of searching roots. As frequent visitor to the park, Saar often drew inspiration her perspectives of the four seasons, and thought it was the perfect setting for this latest work. Elizabeth Emison Metalworks: "Life Is Short, Buy The Shoes"